Find hotel near Estadio Governador Magalh ..
Brazil’s 5th largest football stadium has held many important matches, and was one of the venues for the FIFA World Cup 2014. It’s construction and history has seen both pluses and minuses; for example, while it was the second stadium in the world to meet the environmental certification Leadership in Energy and Environmental Design, it’s actual capacity of 62000 falls far shy of its intended capacity of 130000. The stadium is also frequently used as a concert venue by major domestic and international musical acts such as Kiss, Menudo, Elton John, Paul McCartney, Beyonce, and Foo Fighters. The stadium is also the site of the Brazilian Football Museum. Match tickets can be bought online via Futebolcard, or at the booth at the Stadium. There are plenty of eateries in and around the stadium. Match ticket prices vary between R$ 60.00 and R$ 120.00. Sometimes the closing time may be 1pm. How popular is Estadio Governador Magalhaes Pinto? 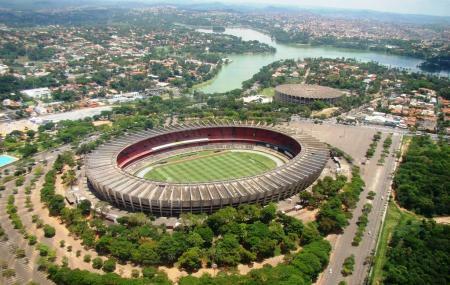 People normally club together Fundacao Zoo-Botanica De Belo Horizonte and Igreja Sao Francisco De Assis while planning their visit to Estadio Governador Magalhaes Pinto. We went to see the Cruzeiro vs São Paulo game, with the whole family, young and old. All in all, it was a good and family friendly experience. It had all the ingredients of a Brazilian football game, the drums, the passion and at least a few moments of some quality football. It's tempting to deduct points for the home team losing the match, and looking like they didn't even want to play the second half (with a couple of exceptions among the players), but I guess that would be beside the point of this review. Be aware that even though the tickets are seated, that is just theoretical. So get there early if you want to sit as a group. Also, be prepared to stand up during most of the game if you want to to see anything at all.